This week we were lucky enough to have Tessa over at Salted Plains contribute this recipe post. For those of you who aren’t familiar with Salted Plains, read on. Created by the talented Tessa Fisher, baking enthusiast and school counselor, adopted a gluten-free diet to eliminate severe migraines. 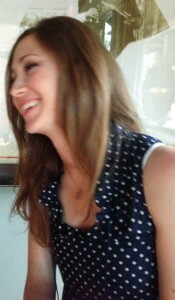 Tessa’s success has inspired her to share her love of gluten-free baking using natural, seasonal, whole ingredients. Find more of her recipes on the blog Salted Plains. 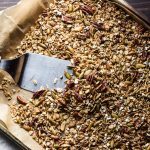 Whipping up your own granola at home is super easy, quick, and allows you to control the amount of sugar and quality of ingredients, while also changing things up and adding in the flavors that you love. It also makes your house smell amazing – like you’ve been slaving in the kitchen all day. I like to use coconut oil because it’s full of nutrients and adds a really nice light flavor to the granola, but you can use any healthy oil you like. I suggest to stay away from olive oil because it has such a strong flavor. Oils high in omega-3 fats, life flaxseed oil, are extremely good for you but should be avoided here as well because they’re meant to be consumed raw and go rancid when heated (omega-3’s don’t like heat at all-don’t cook with them). 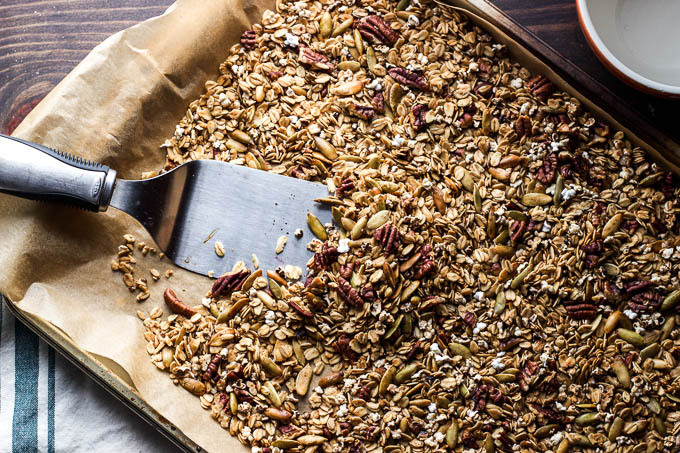 I always add nuts and seeds to my homemade granola for flavor, texture, extra nutrients and added healthy protein. A small amount of unsweetened dried fruit is ok too, just make sure it’s unsweetened to keep the sugar content down. Also use less sweetener if you add dried fruit. To sweeten, I prefer organic grade-b maple syrup or raw organic honey. Grade-B maple syrup is actually better than grade-a as it contains more nutrients and slightly less sugar. Local raw organic honey is also a great option, especially if anyone your cooking for suffers from seasonal allergies–local raw honey that hasn’t been pasteurized will contain small traces of local pollen that can actually help with allergy issues (a little homemade homeopathy). Again, go easy on the sweetener to keep the sugar content down. Always avoid white, highly processed sugars and artificial sweeteners–read the labels of the maple syrup and honey and make sure the only ingredients in the bottle are maple syrup (no corn syrup). Pre-heat oven to 340 degrees. Line a baking sheet with parchment paper. First, start out by popping the whole grain sorghum. Place sorghum in a paper sack and roll down opening, placing flap face down in microwave. Microwave sorghum for 2-3 minutes (took me 3) or until there is more than 5 seconds between pops. Open bag to release heat. See Notes below for stovetop method. 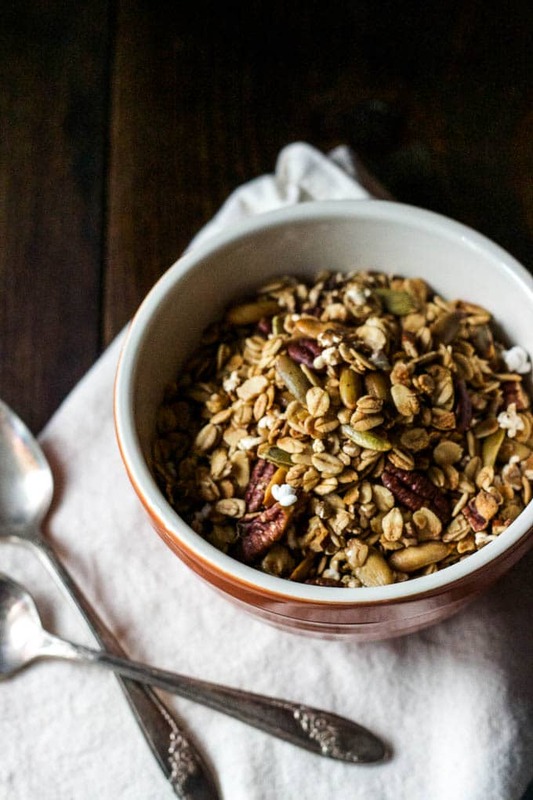 Combine oats, popped sorghum (even the un-popped kernels), pepitas, pecans, salt, and cinnamon in a large bowl. In a small bowl, combine melted coconut oil, maple syrup, and vanilla extract. Pour liquid mixture into dry ingredients, stirring to combine. Stir until dry ingredients are evenly coated. Spread mixture evenly onto baking sheet. Bake for 20-25 minutes or until oats become golden brown, stirring halfway through baking. Remove from oven and allow to cool in pan on wire rack. When cool, add dried cherries or other dried fruit to granola, and place in an airtight container. You can also pop sorghum on the stove by heating a saucepan, adding sorghum, covering, and then shaking saucepan frequently until popping starts. Remove from heat when there is 10 seconds between pops.